A complete book on the cult movie-maker from the 1960s and 1970s. He never won any Oscar and didn’t always have the audience’s favors. His filmography is short and unbalanced. But his films became cult and many movie fans and contemporary directors like Tarantino or Scorsese, claim his influence. This books provides a unique perspective on his entire works. Three long critiques take a look back on his films, through three periods: from The Deadly Companions to Major Dundee (1961-1965) by Chris Fujiwara, from The Wild Bunch to Pat Garrett and Billy the Kid (1969-1973) by Emmanuel Burdeau, and from Bring Me the Head of Alfredo Garcia to The Osterman Weekend (1974-1983) by Christoph Huber. These texts are completed by a study of his TV works (by Jean-François Rauger), some short stories of the shootings and some interviews – including a brand new one with Peckinpah himself. 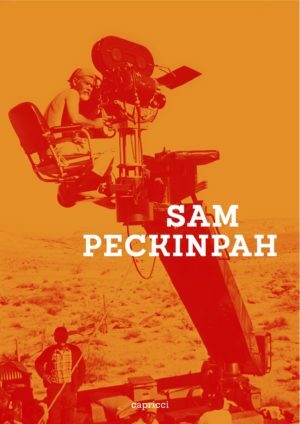 This book, abundantly illustrated in black and white and color, is published on the occasion of the retrospective dedicated to Sam Peckinpah by the Festival del film Locarno in 2015, in association with the French Cinémathèque and the Swiss Cinémathèque.